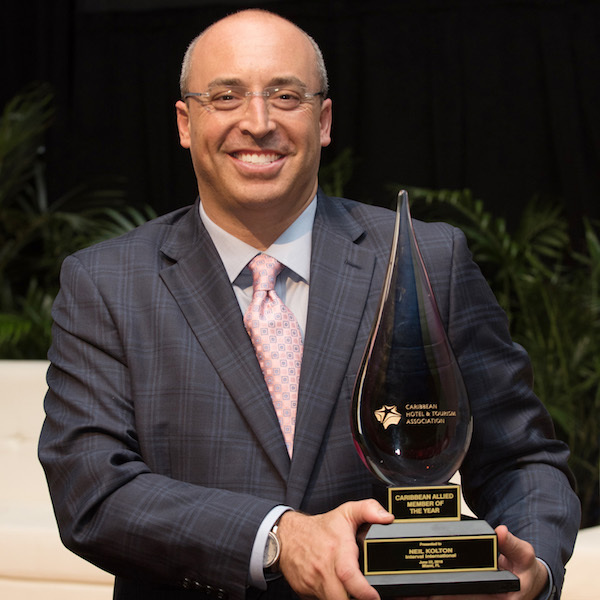 The Caribbean Hotel & Tourism Association (CHTA) honored Neil Kolton, Interval International’s director of resort sales and service for the Caribbean, Florida, and southeast U.S., with the Allied Member of the Year award for 2018. His ongoing advocacy for the education of Caribbean nationals and commitment to the region’s tourism industry was recognized at the opening session of the Caribbean Hospitality Industry Exchange Forum in Miami. “Supporting the work of the CHTA Education Foundation has been an important corporate initiative for more than a decade. It’s been very rewarding to meet many of the scholarship recipients who have achieved their educational and professional aspirations in large part because of the financial support from Interval and its resort clients,” Kolton noted. “I’m honored to receive this award on behalf of the Interval team and the participating resorts that have so generously contributed over the years.” Kolton has been involved with CHTA since August 2007, when he was named Caribbean region manager, and has served as Interval’s representative on the CHTAEF Board of Trustees and the CHTA Board of Directors. He also has participated in a variety of initiatives in support of the association and has helped to raise US$450,000 from Interval and its resort clients for scholarships awarded by the CHTA Education Foundation to students pursuing degrees in tourism and hospitality. Candidates for the Allied Award are evaluated based on efforts in the following key areas: volunteer work with CHTA, membership development, fundraising activities, advocacy activities on behalf of CHTA, motivational impact, work with national hotel associations, and involvement in regional tourism activities. In his position, Kolton oversees Interval’s presence and plays a lead role in building its developer client base in his markets of responsibility. For more than 50 years, the Caribbean Hotel and Tourism Association has been a leader in representing tourism interests for hotel and tourism organizations. Working together with 1,000 hotel and allied members and 32 national hotel associations, CHTA is helping to shape the Caribbean’s future and working with its members to grow their businesses. Whether navigating new worlds such as social media, sustainability, legislative issues, emerging technologies, data and intelligence, or looking for avenues and ideas to better market and manage businesses, CHTA is supporting members in matters that matter most.